Inspiration, be it on or off the ice, is never hard to come by for Mike Komisarek. His passion for the game of hockey is undeniable. So, too, is his dedication to making a difference in the community. It's an unyielding commitment Komisarek, the sturdy, hard-hitting Toronto Maple Leafs defenceman, learned at home. As a youngster, Komisarek, who finds himself just five games away from 400 at the NHL level, would wake his mother early in the morning, armed with a cup of coffee and pillow, in the minutes before she would drive him to practice. "She did everything for me," said Komisarek. "I was very lucky in every way." Komisarek's mother died in 2005, slightly more than 10 months after she learned she had pancreatic cancer. She was 51. “Not a day goes by that I don't think about her,” said Komisarek, who played two seasons at the University of Michigan, recording 46 points and 145 penalty minutes in 80 games, while helping the Wolverines to a 55-24-10 mark, a CCHA title and two trips to the NCAA Frozen Four. “I know that she's smiling and looking after me. It's never an easy thing, but I was lucky enough to have in her in my life as long as I did. Some people don't even have that. It's something Komisarek, who selected seventh overall in the 2001 NHL Entry Draft by the Montreal Canadiens and played his first NHL game in the 2002–03 season with the Habs, has never forgotten. Not even in the face of adversity. 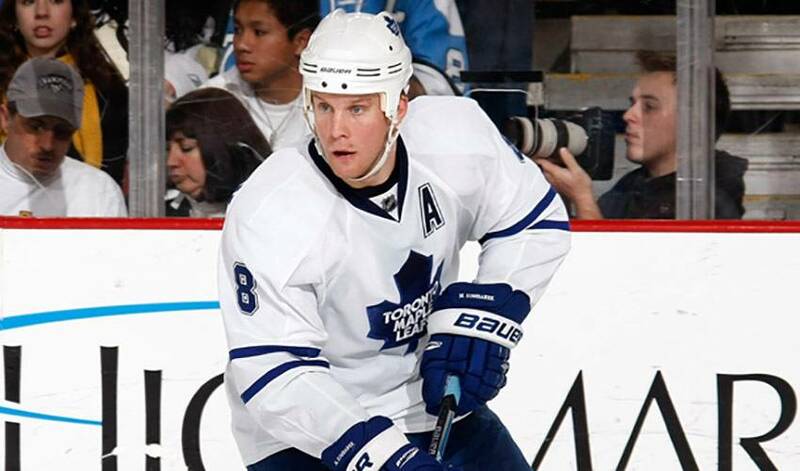 In July of 2009, Komisarek signed a five-year contract with the Toronto Maple Leafs. On January 2, the rugged blueliner injured his shoulder in a game against the Calgary Flames, and on February 3, it was revealed he would require season-ending surgery. It also meant he would miss the 2010 Winter Olympics. So, in a season where little went right for Komisarek and the Maple Leafs, it would be understandable if he was bitter or overly eager to put the misfortune behind him. Not surprisingly, Komisarek is looking forward to having his best year at the NHL level. It's not only on the ice where Komisarek is looking to make his mark. This off-season, the 28-year-old is busier than ever, taking part in several charitable endeavors in Toronto. Maintaining a strong tie to the city is something Komisarek takes great pride in. When the new season gets underway, there's no doubt Komisarek will be more prepared than he's ever been, as a player and as a representative within the community. His mother would certainly be proud to know it.